Recently, the Canterbury community watched a series of films for Black History Month. These showings were organized by Canterbury’s Cultural, Diversity and Inclusion Club (CDIC). Among the films was Spike Lee’s Academy Award-winning and Oscar-winning film Blackkklansman. The film starred John David Washington and Adam Driver as two undercover officers who infiltrate the Ku Klux Klan in Colorado during the late 1970s. The movie was adapted from a novel written by Ron Stallworth, an African American cop who established contact with and was inducted into, the KKK, without the KKK leader knowing Stallworth’s race. 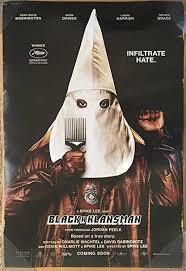 For actual meetings with the KKK, a Jewish cop named Flip Zimmerman posed as Stallworth. Sherley Arias Pimentel ‘19, a member and leader in the CDIC, says that this movie shows a unique perspective of a major event in history, one that is not “in the textbooks”. Overall she really enjoyed the movie due to the creative way Spike Lee portrayed the true story. Sherley believes that the film is directed toward youth, despite its R rating. The end of the film particularly captured the severity of racial problems in America. “At the end, they showed real footage of the Virginia Riots and how [race] is still a problem affecting us today,” said Emily Nigg ‘20. According to Nigg, the film brought the problems to life by including actual, incredibly hard-to-watch graphic footage from the Charlottesville protest in 2017. Tray Alexander ‘20 had similar feelings. Blackkklansman proved to be an incredible success, not just on our hilltop, but as a phenomenon all over theaters across the United States. The events portrayed in the film not only exposes the injustices that occur all around us but reminds us not every major event lies within our textbooks.